to regular 12v halogen MR16 spotlights. 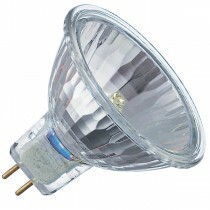 compared to regular halogen 12v MR16 halogen lamps. this enables a lower wattage lamp to be used with no loss of light output. there is no need to replace or change the transformer. Its easy really, IRC = Infra Red Coating, the coating covers the capsule or burner insulating the lamp. For the lamp to operate at its optimum it needs to be at a specific temperature. this is why a lower wattage can be used to achieve the same power output. Which Philips Master Line ES Halogen EcoBoost lamp should I use?